Tigger is about 7 years old and was surrendered to CPL with her housemate Timmy (already adopted) when their owner went into care. Tigger is sweet but shy. She spends much of her time hiding under her blankets but is always happy to pop up for fuss and gentle cuddles. Tigger will suit a quiet adult home and a patient new owner. 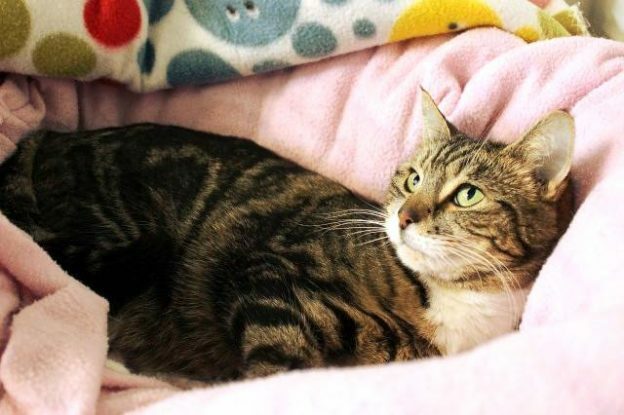 She will need to be kept indoors for an extended period to allow her to fully settle and a potential new owner may wish to spend time getting to know her at the cattery before taking her home.